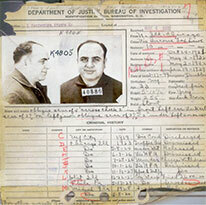 Infamous Chicago gangster Al Capone’s arrest record shows what arrest records looked like in the early 20th century. What a modern day witness report looks like. An arrest record is a criminal report created by a law enforcement entity after arresting an individual. The report details the process and all information regarding the nature of the offense, the details of police interrogation to criminal charges and future court dates, all aspects of why, how, and what will follow in relation to an arrest. A police report is a document that describes all information found and experienced by a law enforcement handling an incident, arrest, or crime in question. Its purpose is to record the incident, names, witnesses, the crime itself, offenders involved, and the nature of the incident. It also serves as a means of recording all details of the criminal activity involved, whether that information is significant at the time or not. Police reports are valuable to the criminal justice system. They serve as a firsthand account of all details regarding an incident or criminal offense. While most information in both civil and criminal legal cases is based upon hearsay (one word against another), a police report is documented at the very moment of the incident, and typically includes information on the scene of the incident, witness reports, the arrest, crime notices, photos taken at the incident site, and more. This means that the arresting law enforcement agent has to describe details in a timely and accurate manner, and that their review of the happenings cannot be altered once it has been written down, making it useful for future use. Because of this, many criminal cases can be heavily influenced by police reports. One of the main reasons that it is given such weight in court is it is the only evidence on the police officer’s side of the case. In many cases, law enforcement agents are given more credibility due to the nature of their profession, but it is also vital that this ideal is not abused by the law, and this is why proof for any parties in a criminal case is crucial. For the law enforcement witnessing and handling the criminal incident of which the court case is based upon, the police report is the foundation for the prosecution and defense of the offender in question in regards the police perspective. The report is a hugely influential factor in regards the outcome of most criminal cases. Depending on what details are included, such as opinions of the criminal activity, witness accounts, and observations from the police on the state of mind of the potential offender, the judge will typically rule in accordance with the findings and claims made in the police report, provided they are valid and strong enough. The possibility of the police officer’s position being abused is typically overlooked. The police report is also first piece of information entered into the criminal legal system to be processed, meaning that it sets the stage for all charges to be filed, dismissed, penalized or acquitted. It is the purpose of all criminal cases to verify report information, and use it to sustain, beyond a reasonable doubt, the burden of proof. While most arrest record information is available to public and private entities, some records are restricted according to state legislation. One of the most significant aspects of any arrest record are the details of the police interrogation. Usually, this information is not available to parties other than criminal justice bureaus and related police personnel, but its contents can be very useful regarding the nature of the police arrest and crime committed. A police interrogation facilitates the police’s ability to get as much information regarding the crime committed as possible through a line of questioning that relates to the nature of the incident. Most often, an interrogation will occur after the police has taken a criminal into custody, but there are still other incidences in which an interrogation can occur. While criminal questioning can offer invaluable information regarding a particular crime or incident, there are a number of factors that directly influence whether or not the information acquired is admissible in a court of law. What are the Miranda Rights and the Miranda Warning? 1. You have the right to remain silent and refuse to answer questions. 3. You have the right to have an attorney before speaking to the police and to have an attorney present during questioning now or in the future. 4. If you cannot afford an attorney, one will be appointed for you before any questioning if you wish. 5. If you decide to answer questions now without an attorney present, you will still have the right to stop answering at any time until you talk to an attorney. 6.Knowing and understanding your rights as I have explained them to you, are you willing to answer my questions without an attorney present? 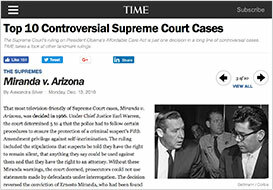 Miranda v. Arizona was the foundation of the Miranda Warning, and its necessity. Of the rights afforded anyone being brought into custody by law enforcement, the right to legal counsel is the one right that creates the most cases of Miranda violations in criminal cases. In these matters, the potential criminal may request to contact their attorney and have them present, and the law enforcement handling the case may either stall or not provide it at all. This is typically conditional on the information gained from an unlawful interrogation. So, what exactly is the protocol regarding how an offender is questioned regarding an offense? It is important to recognize how an offender can be questioned. There is formal questioning, that negates a criminal’s Miranda Rights, and also questioning that results in information freely given by the potential offender. Since all types of questioning are similar, it is notable how criminal law can easily become complicated regarding what information was solicited legally and illegally. The first type of questioning involves detainment, and must be solicited through the due process of the law; following the notification of the spoken federal Miranda Rights. If an offender is taken into custody, they must be given their Miranda Rights. In the second circumstance, the criminal is not given their rights previous to questioning, in which case the rights are said to be violated. In this case, the information gained from the interrogation is rendered inadmissible in a court trial. As one can imagine, there can be a lot of pertinent information gleaned in either one of these scenarios that can be used to either prosecute or acquit a criminal of said charges. This is why it is so crucial that law enforcement handle the case appropriately. Otherwise, all of their work could be rendered useless. In the third of these scenarios, how the information is solicited can be a bit complicated and difficult to ascertain. In this case sometimes information may be given freely by the potential criminal previous to being taken into custody. A police officer can ask a potential offender questions about the nature of their whereabouts and involvement in the crime committed, and if the potential offender answers accordingly, this information can be used in a trial, by the prosecution. Additionally, if the defendant chooses to waive their rights for a full disclosure after being made aware of their Miranda Rights, all information gained therein is legally admissible in court as evidence for conviction of the crime in question. 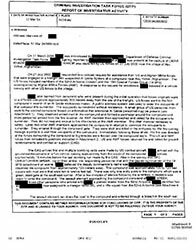 It can be and sometimes is disputed by the defendant that the information that was provided as evidence was not a part of any full disclosure. Instead, many defendants deny ever having waived these rights, which puts the burden of proof upon the prosecution. In the matter of police questioning, it is a very tricky subject for the defendant being questioned, possibly arrested and potentially charged. This is why most individuals are aware that during any questioning by law enforcement, that they should choose to remain silent and ask for their attorney. Whether or not a particular individual is aware of their rights during a police questioning and any other questioning by law enforcement will determine whether or not a potential criminal is charged, and consequently, convicted of the crime in question. Not only does this affect the crime a particular individual is arrested, charged, and convicted of, it also directly influences what is listed on their criminal record. While the accessibility of certain types of offenses are determined by the state the offense was perpetrated in, the standard presentation of crimes in a criminal record rests significantly upon how the individual was arrested and what sort of details were learned from the report and formal questioning during the incident. 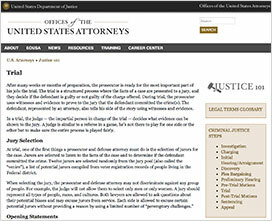 Unfortunately, in most cases, the information gleaned from questioning is limited to law enforcement and court officials, but simply recognizing that this particular part of the law process can indeed affect the entirety of how a crime is listed in a criminal record is invaluable to a comprehensive criminal records search. An arrest report contains invaluable information, with one of the most important pieces being the charges filed. Allegations that are recorded against the defendant in an arrest and subsequent trial, are listed in the title and description of the arrest record, and denote all necessary details of the crime committed in question. This section of a particular arrest report also lists who or what entity is filing the allegations. When an arrest is first made, charges are filed that detail the nature of the crime, the victim, and also the individual who is being charged with committing the crime. There are a wide range of formal criminal indictments that can be brought against a defendant, and depending on the allegations, certain penalties will ensue if convicted. Even if a defendant is not convicted of a crime, their criminal record will show that allegations were made against them. The first step in assessing allegations is what is usually called a filing of an “information”, which is defined as a formal accusation of the perpetrator’s involvement in a particular offense. In an offense that is brought by a private entity, it is a sworn statement listing the perpetrator, the offense, and their involvement in the happenstance of the offense. In an offense that is brought against a defendant by the state, the state attorney will draft a sworn formal statement that an offense has been committed in contradiction to state law. In the case in which a crime committed is of a federal nature, the plaintiff or prosecution is referred to as the “government”, and is carried forth by the U.S. Attorney General. Depending on the severity of the crime and the jurisdiction which is responsible for its processing, allegations are carried forward into what is called an “arraignment”. An arraignment is the first instance in court in which the judge decides whether there is enough proof or information to set a formal court date for the indictment. This is the instance when the defendant is able to formally announce their plea of guilty or not guilty to the aforementioned allegations. If the potential criminal has decided to plead not guilty, the case will most likely proceed to trial, unless the judge or prosecutor decides they want to dismiss the indictment. If the potential criminal decides to plead guilty, the case will most likely not go to trial, and will instead, be subject to punishment. Previous to the defendant’s public plea of guilty or not guilty, they will be made aware of their rights under the 6th Amendment to the Constitution. This amendment states that every defendant has the right to “a speedy and public trial, an impartial jury, to be informed of the nature and cause of the accusation, to be confronted by the witnesses against them, to be able to subpoena their own witnesses, and to have the effective assistance of counsel at all crucial stages of the prosecution”. From this announcement, the defendant can make their plea clear publically. While the actual plea entered may seem a simple, it depends on a number of factors in the legal system. There are three basic pleas: guilty, not guilty, and the occasionally available no contest, or nolo contendere (literally “I do not contest it”). Many defendants choose on their own or on the advice of their attorney to plead guilty to lesser charges than those originally recorded, in exchange for a reduced penalty or sentence. This is known as a plea bargain. It is originally suggested that entering for a plea bargain at this stage, rather than later, will help the prosecution consider a lesser charge to compromise with. If the case has started to progress, and the defendant decides that they are either probably losing the case, and they request a plea bargain, then the prosecution is much less likely to offer anything less than a full penalty. Nolo contendere helps a defendant avoid being convicted of two sets of indictments. In certain criminal cases, two offenses may be in question regarding legal allegations, and if the defendant admits guilt to one, he could easily be found guilty of the other. In this type of situation, the defendant would offer a plea of nolo contendere and most likely get a reduced sentence or penalty for the offense in question. One of the more common pieces of information that could be included in a particular arrest record is whether or not the particular charges were brought to conviction or dismissal. While almost any defendant hopes for their criminal charges to be dismissed or forgiven, whether or not they actually are rests wholly upon a variety of legal factors. When it comes to getting criminal allegations discharged, there are only a couple of reasons that the judge and prosecution might choose to do so. When criminal allegations are dismissed, it is by the will of the judge or court overseeing the criminal case in which the potential offender stands. The ability for this to happen can occur anytime after the arrest and up until the conviction of the defendant. While discharged indictments are somewhat common as a means of separating significant cases from those unworthy of a trial, the majority of offenses brought up for conviction will not be discharged unless one of two factors are present. The first reason is if there was something legally unsound about either the process of the arrest or the criminal accusations themselves. There may be many times in which a private or legal entity decides to bring an indictment against a particular individual, and either there is not enough proof, or they are not arrested in the legal process of the law, such as when the defendant is interrogated with being made aware of their Miranda Rights. In either of these related reasons, the indictment can be dismissed. The second reason why there may be a dismissal of charges is if the judge decides that the defendant is guilty of the allegations, but because either the nature of the case or the mild criminal history of the defendant, the judge decides to dismiss the allegations and offer alternative sentencing. This type of alternative sentencing can come in a variety of forms such as a fine, community service, education classes, probation, and more. When it comes to a dismissal of accusations, there are two entities that can dismiss an indictment. One is the judge overseeing the case, and the other is the prosecution. While it is ultimately the decision of the judge whether or not a set of allegations is dismissed against a potential offender, the prosecution and the defense has the right to ask for the judge’s ruling of discharged allegations. In relation to a defendant’s criminal record and history, how do allegations that have been discharged present themselves and relate to the information available to the public? While charges dismissed are much less serious in nature than those that are formally filed and prosecuted, they are still present on a person’s criminal record, as discharged allegations. It will show what the criminal indictment was in nature and why they were discharged by the judge overseeing the criminal case or by the prosecution pressing the original accusation. 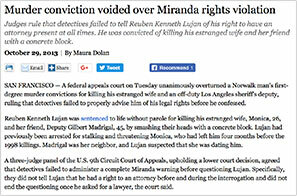 A case from 2013 which led to the case being dismissed after a failure to provide Miranda Rights. When indictments are discharged in the criminal legal system, the defendant is not found guilty or not guilty. Instead, the allegations are just discharged. The only way in which discharged allegations can be absent from a defendant’s criminal record after having received them is if the record is expunged. While getting this sort of criminal record expunged is an option, it does need an acceptable reason for doing so, and is not necessarily easy or commonly successful. This said, depending on the nature of your criminal records search, there are ways in which criminal records can be accessible to you, and ways in which they are restricted according to federal statute and state regulation. A good example of federal statute limitations is how an entity asks a past defendant if they have been charged with a crime or if they ask if they have been convicted. One of the ways that arrest records are kept as sound and accurate as possible is by maintaining different identifiers to match the person to their history. Fingerprint information is taken for every arrest made, and is therefore, a necessary piece to any arrest record there is. They are used as the foundation for all subsequent criminal processing, and by using fingerprint identifier information, the law and court systems are able to match up the right individuals with the crimes they have been arrested for, as well as conduct searches through their databases when looking for future arrests in particular cases. One of the first aspects of fingerprint identification information is how fingerprints work. Each person is born with their own unique set of lines, loops, arches, ridge endings, and ridge patterns on the inside of their fingers. This is why using them for identification still exists as an accurate means of processing individuals. Fingerprints are still taken the same way they are initially when an arrest is made. Despite the access to technology we have today, it is still most common to collect fingerprints with paper and ink on a piece of paper cardstock (though digital fingerprint readers are also commonly used when available.) When an individual is arrested and processed, part of this processing includes their identification through prints. There is no other identifier that is as accurate, inexpensive, and convenient as the fingerprint identifier. Fingerprint verification systems scan and capture a fingerprint, then take another capture to determine if the original matches the second. These systems are helpful, fast, and very basic. They are even used for personal security on home and work computers in the form of a digital fingerprint reader. Fingerprint identification systems, on the other hand, are much more state of the art, and are systems that use the set of prints taken at the processing of an arrest to match it against a comprehensive database of millions of other prints. These systems are invaluable in searching the database for past criminal records and offenses committed by the arrestees. This gives law enforcement an idea of whether the arrestee is a repeat offender, has a clean record, or has a history of criminal activity. Additionally, these identification systems can be used in connection to other law enforcement departments in different jurisdictions to locate current activity on the arrestee by submitting one digital stored set of fingerprints to another. In the arena of criminal records, these identification systems are still being used only for criminal justice agencies and law enforcement. The FBI holds strict dominion over their own database, called National Crime Information Center, and they alone determine who may access the files contained therein. Depending on what sort of entity you are and the purposes for which you would like access to these files, chances are good that you will not be able to access information from the NCIC. 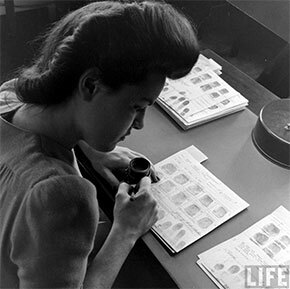 A photo of a worker at the FBIs former fingerprint warehouse. Thousands of women worked at this warehouse to look up and file fingerprints prior to the digital age. Consequently, most entities seeking a means of verifying potential offenders against a law enforcement database are most often forced to use non-biometric (or non-organic) identifiers. Non-biometric identifiers are much less accurate in matching individuals as they rely on a variety of loose applications to identify potential criminals. Examples of non-biometric identifiers are called demographics, and are typically collected as names, dates of birth, addresses, and more. While one may think that using these non-biometric identifiers to identify a criminal and their criminal record would be very accurate and easy, in most cases, using these identifiers offers a wide margin of error. This is because there are so many people in criminal record databases, that simple variations on name and address can easily identify the wrong individual. Consider, for example, the name John Smith. There are probably thousands of John Smiths in a criminal records database, so there’s a huge possibility of error. The same can be said of addresses. Additionally, each name may have different variations, such as “J” instead of John. 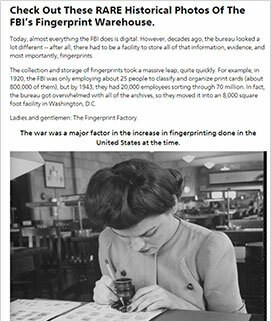 Historical photos of the FBIs fingerprint warehouse. While one may think that using these non-biometric identifiers to identify a criminal and their criminal record would be very accurate and easy, in most cases, using these identifiers offers a wide margin of error. This is because there are so many people in criminal record databases, that simple variations on name and address can easily identify the wrong individual. Consider, for example, the name John Smith. There are probably thousands of John Smiths in a criminal records database, so there’s a huge possibility of error. The same can be said of addresses. Additionally, each name may have different variations, such as “J” instead of John. Bail is a refundable deposit ordered by a judge, and returned to the bail defendant upon their attendance to their criminal trial. Bail is an amount with the purpose of keeping the particular potential criminal close, so as to ensure that they do not leave town to avoid criminal conviction and sentencing previous to their trial. If the offender does not show up to their court date, the court will then keep the bail deposit and issue an arrest warrant in lieu of abided bail terms. It is often questioned how bail can be determined and what the bail amount depends upon. Most courts determine amounts of bail and bail penalty based upon a specifically-defined bail fee schedule, which changes depending on the nature of the crime. Courts are regulated by the Eighth Amendment of the Constitution to set limits on bail amounts, which orders that “the amount of bail must be no more than is reasonably necessary to keep them from fleeing before a case is over”. While many courts do abide by this regulation on bail, still others use what is called “preventative detention” by setting impossibly high amounts for bail, making freedom for the potential criminal impossible. In many cases, a bail is set on a particular offender’s release, while in others, the offender can be released from jail to await their trial date without a bail fine. This is known as being released on your own recognizance. If an offender is given a bail amount to pay, it is ordered to be paid by bail cash or a check in full, in property worth the amount of the bail, a bail bond, or a bail waiver of payment. This is typically used when a judge releases the defendant “upon their own recognizance”, and no bail is formally set. Bail bond is a common means of approaching bail, as many bail defendants do not readily have access to the amount of bail required of them, but would still like to await trial outside of jail. What happens in the scenario of a bail bond, is that the defendant gets the help of another entity willing to loan them the amount of the bail for release, on the condition that they show up for their court date. Typically, the bail bondsman will take 10% of the bail amount for their services in loaning the bail defendant the bail amount. In many cases, the bail bondsman will require some sort of bail collateral at the time of the bail loan, from the defendant, such as holdings in their property. If the defendant does not show up for their court date, however, the bail bondsman can keep whatever valued property was promised to them at the time of bail. The first part of any crime is the arrest, followed by the court processing of criminal charges, the setting of the bail amount, the court arraignment, and the setting of the court date. The court arraignment is when the court date is set. The preliminary court hearing and court arraignment sets the stage for all subsequent criminal processing and conviction status, which includes whether or not a court date is set. This, in turn, is directly influential when it comes to the criminal record that reports all of this information for future use. In a standard court arraignment the court process goes forth on the arraignment date. The presiding court judge reads the criminal charge to the defendant, inquires regarding their legal court representation (if they need court representation), asks how the defendant pleads (guilty, not guilty or nolo contendere), and decides whether to change the court bail amount or release the defendant upon their own recognizance previous to the court date. Depending on all these factors and how the prosecution and defendant present themselves, the court judge will then decide to dismiss the criminal charges or set a court date for prosecution. At the end of which a specific date will be set immediately. The first aspect of the court arraignment is simply a matter of presentation, making sure that all parties involved know exactly what the criminal charges are, against who they are levied, and as a result of which prosecution. The second of these is the question regarding representation, which is a necessary aspect of any future court date and trial. In many cases, the defendant cannot afford an attorney to represent them, in which case, the judge will appoint a public defender to do so at a future court date. Third is how the defendant intends to plead according to the charge in question which is directly related to a possible future trial date. Depending on whether they plead guilty, not guilty, or no contest will determine the likelihood and nature of a future court date. In the case of a not guilty charge, the defendant has said that they want to invoke their right to a court trial for the charges against them, and a court date will then be set. If they choose a plea of guilty, more often than not, the court sentencing will be based upon a plea bargain for a lesser charge or compromise with the prosecution. With all these matters, the judge will then determine to raise, lower, or nullify any presence of a court bail. One of the most basic aspects of information of any formal arrest record is the prosecution information. Not only is it invaluable to ascertain in an arrest report who is the potential criminal, what the criminal charges are, bail specifics, and other information, but knowing information regarding the prosecution is necessary to the criminal process of the crime in question. Marcia Clark, who prosecuted the O.J. Simpson trial, speaks on what it’s like to be a woman prosecutor at the time. In an effort to best understand why the prosecution information is such a necessary part of any arrest report, it is crucial to disseminate exactly who the prosecution is and what their function is in any criminal court case or proceedings. So, who is the prosecution and what is their purpose? In a criminal case, the prosecution is the side endeavoring to prove that the defendant committed a crime in question. Depending on whether the court case is of a criminal or civil nature, what sort of entity the prosecution is will be determined. As regards the prosecution of any crime, it is vital that one understands who the prosecution represents, and how this prosecution information can greatly vary according to the nature of the criminal case. There are two basic types of court cases that can be brought before a judge: civil court cases and criminal court cases. In criminal cases, the offenses are either felonies or misdemeanors, and are tried before a judge and prosecuted by the local, state, and federal governments. This is due to the fact that any crime is considered an act against the community, and thus the community of that jurisdiction is represented by a government prosecutor. In a civil case in which it is plaintiff against defendant, and determining the outcome of less serious crime such as contract disputes, the prosecution works on behalf of an individual. The process in which court is held. In a criminal case, the information structure the court process varies greatly from one in a civil court, in that it is the burden of the prosecutor to prove the defendant guilty with information called proof. In criminal law, a defendant is considered innocent until proven guilty by this information, and so a lot of information must be brought to the criminal court proceedings to carry the proof beyond a reasonable doubt. This is typically done with the help of legally admissible evidence that takes the form of physical evidence and testimonial evidence which is a verbal recounting of a witness. Just as the defendant is necessary to any court case, so is the prosecutor. The prosecution information is key to the processing of any criminal as the entire court proceedings are based upon their call to action of the criminal charges respective of the crime the defendant is being charged with. With this in mind, prosecution information should always be valued as a part of any arrest report as it characterizes who the prosecutor is, and their relation to the charges.